A fire pit is a great place to gather and relax with family and friends on summer evenings. 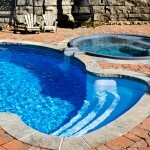 We at Lake Norman Signature Pools & Patios are proud to offer great fire pit designs and installation services. Our team also wants to help you have the best experience with your fire pit once it’s ready, and that includes enjoying it safely. In this article, our experts at Lake Norman Signature Pools & Patios will lay out some essential safety tips for using fire pits. Before Using- Before you use your fire pit, you should familiarize yourself with how to use a fire extinguisher and should keep one on hand in case of emergencies. You should also be aware of the dangers of smoke inhalation, and accordingly place your fire pit in an open, well-ventilated area to prevent it. In addition, you should always place your fire pit on a stable surface and away from any overhanging branches. If you are installing a permanent fire pit, our team can help you select the ideal location. While Using- When you’re ready to start your fire, use only recommended fire starters, and never use gasoline. Never pile your firewood too high, as you don’t want any embers spilling out of your fire pit. Avoid using fire pits when it is very windy, and use screens to prevent sparks from escaping. You should never leave a fire unattended, and make sure you keep a close eye on children while the fire is burning. Dousing the Fire- Make sure you extinguish the fire completely, using a fire extinguisher or enough water to completely soak the wood or coals. Keep pouring water until there is no steam. After you’ve doused the flames, cover your fire pit with a lid as further protection. If you follow these safety guidelines, you will be able to enjoy your fire pit free from worry. Call our team at Lake Norman Signature Pools & Patios if you have further questions about fire pit safety.